Moving on from Olympic National Park and Port Angles, we found another Boondocker’s Welcome campsite nearby. Well, sort of nearby. It would mean we’d have to take our Tiny Shiny Home on a ferry from Port Townsend to Coupeville. We did that with the 5th wheel and it was stressful then. Spoiler alert: it was still stressful with the Airstream. Mostly just because we had put so much blood, sweat and tears into the remodel. We got there early and were able to have some fun exploring the wharf area. Thankfully, it all turned out great and we were across the bay in no time. Our host - as usual from our experience with Boondockers Welcome - was amazing and welcomed us in even as they were in the middle of moving out. That’s right - we may have been the last people to stay at this particular property. Which is too bad, because the location was perfect. Up on a hill where the breeze blew in from the bay - it was a solid 10 degrees cooler there than anywhere else in the area. Our hosts even showed us their two huge, beautiful macaws and had papers ready for the kids to take to learn more. How cool is that? After poking around a bit I found a cool little deserted beach in their neighborhood way down at the bottom of the hill. We went out a couple of nights to watch the sunset and it was gorgeous. Speaking of the sun, we were here during the Solar Eclipse of 2017. While we weren't in the path of totality, we definitely noticed some weirdness like birds chirping in the middle of the day and shadows looking like we'd never seen them before. The annual hydroplane races on Whidbey Island just happened to be going on while we were there so we had to check that out. They were so loud! 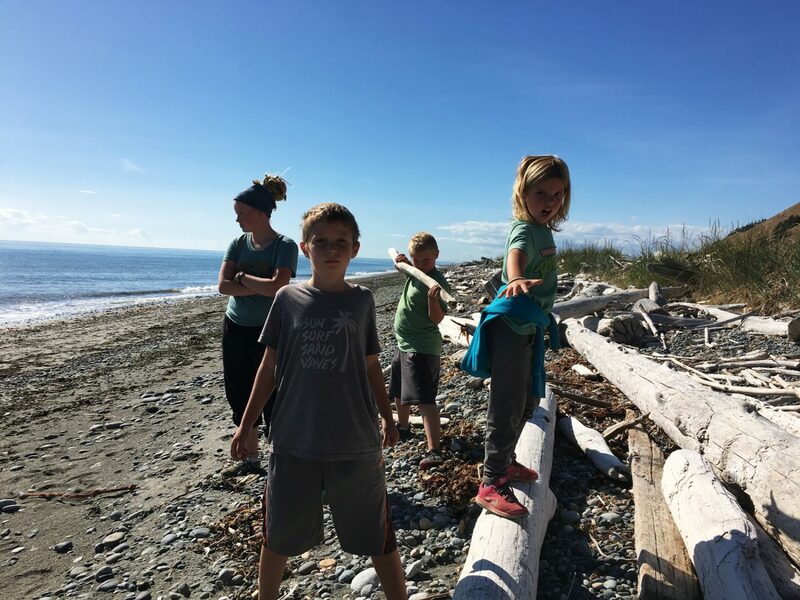 I was itching for a good hike and settled on the Ebey’s Landing or “bluff” trail. Man, I’m glad I did. What a beautiful trail! Basically you start at one end and either head up on the bluff or stay down on the beach and just loop around for about 3.5 miles. We decided to go up higher first and were treated to breathtaking views of the Bay and windswept trees. As we continued along a massive lagoon became visible down below and we loved how it’s appearance kept changing the further we hiked. The weather was perfect, they sky was blue and the mountains on the other side of the bay were easily visible. Finally we began our steep decent down to the shore and walked the rocky beach all the way back. Our last morning here Ashley decided to take the kids to Fort Casey. We didn't do much research about it but it looked like something the kids would enjoy. They got there early and went to the Ranger Station and were handed a papers for their own scavenger hunt. The kids enjoyed reading about the fort, searching for the items on their lists, and walking around the grounds. They even got a bag of goodies when they returned their papers from the scavenger hunt. You could easily spend a whole afternoon exploring the grounds there. We had so much fun in this area and were grateful for a convenient place to stay for a few days while we explored. What about you? Do you have any favorite places to visit in the Coupeville area?